Arcade Video Game published 35 years ago by Sigma Enterprises, Inc. Wanted © 1984 Sigma Enterprises. A third person shooter based in the wild west. 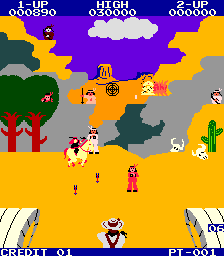 In the old wild west, times has get tough, you play on the role of a renegade cowboy surrounded by hostiles native indians, mexican bandits and the most wanted outlaws, in the most varied and iconic west landscapes and they attacking you from all directions, must shoot them all to defend and advance to the next level.